In my part of the world we seem to have bypassed Spring at least for the moment and have gone right to summer. It's crazy out there- 30 degrees! Unheard of in March and still in my opinion, a little unsettling maybe. I am looking forward to flowers though. Sabina Pettitt from Pacific Essences, www.pacificessences.com identifies three flowers as being particularly significant of spring. They include Purple Crocus, Narcissus, and Windflower. Yesterday's picture was of a Purple Crocus. These guys are defiantly a sign of spring around here and seem to often bloom in that transition when there is still snow on the ground but spring in the air. In her book "Energy Medicine: Healing from the Kingdom of Nature", Pettitt writes that Purple Crocus is a flower that can be used for resolving tension from grief and loss. The buds are deep purple, the colour of mourning and tightly folded inwards symbolizing the journey within that grief requires us to take. But when they open a wonderful yellow center is revealed symbolizing another part of us that embraces the experience of accessing a new inner part of ourselves as we shed that layer. Pettitt writes that Purple Crocus helps us respond to exactly who we are. It corresponds to our throat chakra helping us express ourselves and release our grief. Maybe the Purple Crocus can help me release the grief of missing snow days and embrace the wonder of springtime! 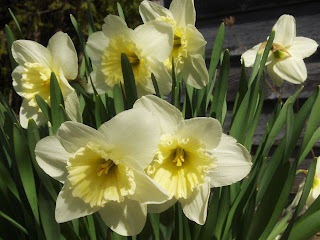 Today's picture is the Narcissus, usually the flower I see closely behind the crocus and another clear sign of spring. Pettitt lists this as one of the "spring flowers". Pettitt writes the Narcissus is the "slayer of internal dragons". It has a calming influence when it seems like life experiences are providing a cycle of challenges. The Narcissus is closely linked to the stomach and that feeling of being "unsettled" when little butterflies of fear may be disrupting peaceful flow. The Narcissus sends a message to allow our thoughts and emotions to digest and flow freely rather than getting stuck and disturbing our mind. The Narcissus resonates with the Root chakra. It can help us feel grounded when our thoughts stray to dreamland or threaten to overwhelm us with the "to do" list. It reminds us that the spring sunshine is meant to nourish us gently and nurture us as we come of the cave. The third spring flower according to Pettitt is the Windflower. This is also known as pulsatilla and is prepared as a common homeopathic remedy. This flower is described as being shy or timid. It's a soft furry violet flower that appears more often on the prairies than the coasts. It is said to open only when the wind is blowing. I guess it needs that little bit of encouragement to open up and reveal itself. Pettitt explains the "Windflower essence provides us the security necessary to express our spiritual being". I think when we come out of the winter cave we need to know the world is safe enough that we can reveal all the things we discovered while we were sleeping. Like the Narcissus, the Windflower speaks to a grounding type energy. We feel safe and nurtured so that we are able to speak our truth as it comes from the heart. I'm told today, in 30 degree weather, that it is predicted to snow by the weekend. I'd say there is a 50/50 chance of that snow. Of the two horses in my backyard, the one that is having the shedding "issues" is still shedding, and she is standing in the sun soaked with sweat. http://pixiedusthealing.blogspot.ca/2012/03/shedding-layer-bach-flowers-for-animals.html Apparently it is a good feeling because she doesn't move to the shade. She seems very peaceful to be shedding now- maybe she's convinced she was right to loose that layer. Perhaps she feels safe enough to let go and let be. Her brother however, is still sporting his winter coat, hasn't lost a hair, is standing in the sun, and has nary a bead of sweat of him. It seems he believes it's still a little premature to bring out the shorts and sandals. He's still holding his wisdom within. He's waiting for the flowers.